I forgot to come in and water all the newly planted seeds over the long weekend…oops! Luckily, it doesn’t look like much harm was done. Everything was just starting to come up, and the germination is about what I typically expect. The tomatoes are almost 100% germination (I counted 3 pots without a plant in them) and the peppers and eggplants are lagging behind and slightly spottier in germination. The ‘Big Bertha’ peppers that we are using 3 year old seed aren’t coming up yet…which isn’t too surprising. Both eggplant and peppers like nice warm conditions for germination, so I usually expect worse (or slower) germination. There is only one variety (‘Rosa Bianca’ eggplant) that has no germination evident yet. I’ll probably give it until the end of the week before replanting. 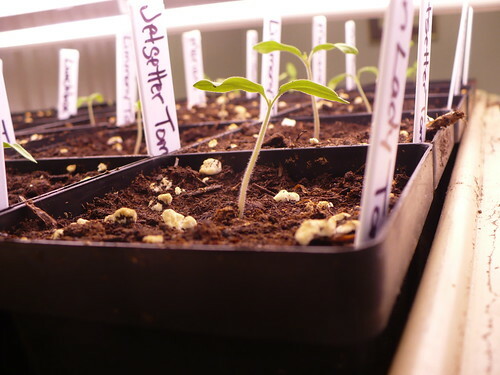 Posted on April 2, 2013, in Around the Garden and tagged eggplant, indoor seeds, peppers, seed starting, Tomatoes. Bookmark the permalink. Leave a comment.